Permanent makeup is makeup that you don’t have to put on every day! The makeup pigment is tattooed into the inner layer of the skin. Who typically gets this done? Your neighbour. Your teacher. Your mom. Your grandmother. Women from all walks of life can benefit from this procedure, as there are so many reasons to get it done. Whether you have no eyebrow hair or just too little of it, you will save time every day by not having to “put your brows on.” And of course no more worrying about sweating or wiping them off accidentally. Go to the gym, beach or special event without fretting about your eyebrows. Women whose close-up vision isn’t as good as it once was, or who’ve never been sure of the right way to draw their brows on, will enjoy the renewed confidence of just having their eyebrows “there” – in the same place & shape everyday. Why choose HD Microblade Brows? HD Microblade Brows is all about the tool – the Microblade. It is a cutting edge micropigmentation device coming to us from China – where getting permanent makeup done is as common as getting your nails done! That being said, artists in China tend to be ahead of the curve on the latest and greatest tools & techniques in the industry. The Microblade absolutely creates the finest, crispest, cleanest hairstrokes possible, which allows for the most natural looking eyebrows to be created. It only recently made its debut here in Toronto, being used first by Tina Davies, who then trained Bren of Brows By Bren in its use. Only a handful of other artists are known to be using it in North America. First, Bren will give you a thorough consultation to learn about your personal style and any eyebrow design preferences you may have. She will assess your features and make recommendations on the best eyebrow shape for your face. She will then create your eyebrow design, using regular makeup pencils. Once you’ve confirmed that you love the design, careful measurements will be taken to ensure symmetry and balance. This final design will then be Bren’s pattern for the procedure, staying on the skin while she tattoos – which ensures that what you see when she’s done is exactly what you saw when she started! Bren uses the most effective topical numbing agents on the market, which ensures client comfort. The majority of clients report feeling only a mild stinging sensation during the procedure, if anything at all. Do I need to remove my existing eyebrow hair first? No. Bren will work with your existing eyebrow hair, blending her hairstrokes in seamlessly. For the first few days, your new eyebrows will be about 25% darker than your ideal colour. This is more noticeable to you than to anyone else. There is no swelling, and only some clients will experience slight redness around their brows for a few hours after the procedure. Can I resume my normal activities immediately after the procedure? Mostly. The only restrictions to your activities will be that you cannot engage in intense, sweaty exercise the day of and day after your procedure, and you cannot sunbathe, swim, or use a jacuzzi during the first week after your procedure. How long will my HD Microblade Brows last? Permanent makeup is referred to as such in the sense that it’s makeup you don’t have to apply every day. However, it is still a tattoo, and will gradually fade out over time. And since it’s on your face – where the skin is thinner and always exposed – it will fade quicker than your average body tattoo. Your eyebrows will require maintenance top-ups approximately every 1 to 3 years to freshen them and keep them looking their best. The frequency of top-ups varies person to person, depending on factors such as: amount/frequency of prolonged sun exposure, skin type, types of face-creams used (anti-acne & anti-aging products should not be put on permanent eyebrows), metabolism, and also personal preference on darkness of eyebrow colour. Top-ups cost much less than the original procedure. I’ve had my eyebrows tattooed elsewhere and am unhappy with them – can I get HD Microblade Brows on top of what I have? Only if your existing eyebrows are very faded. 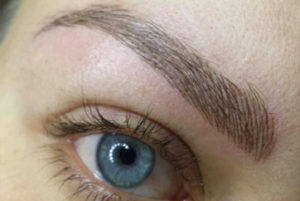 Since HD Microblade Brows are created with very fine detail, they are not “heavy” enough to completely cover a previous tattoo that has not significantly faded yet. Laser tattoo removal sessions are an option you can consider, to lighten or completely remove what you have. You can email a photo of your brows to Brows By Bren to find out if she can work on them as they are. Please note that Bren does not offer laser tattoo removal, but she can refer you to a reputable clinic. I’m pregnant/breastfeeding – can I get this done? The procedure itself is safe, but the numbing agent is not. Since it may be difficult to tolerate the procedure without being numbed first, Brows By Bren recommends waiting until after you’ve had your baby and are finished breastfeeding. Permanent makeup, or as referred to in medical world- micropigmentation, is a form of cosmetic tattooing. If you have light eyebrows, no eyebrows, or partial eyebrows, a permanent makeup procedure can help. A lip tattoo will reduce “lipstick bleed,” and give more definition to the lip line. With a colored lip tattoo, lip scars disappear, plus you can kiss lipstick good-bye. After an eyeliner tattoo, you can put away your eye pencils for several years. The process is just like getting a regular tattoo. Proper sterilization, techniques, and licensing are key. Every procedure includes one complimentary touch-up within 2 months. Microblading (or eyebrow embroidery) is a relatively new, manual method. It is considered to be semi-permanent, as compared to the traditional hairstroke (feathering) technique. It is done using a very fine blade to deposit pigments into the epidermis. Because we’re impacting color closer to the surface, the strokes appear crisp and very fine. The results are natural looking, hair-like strokes, regardless of the amount of hair present. The pigments used in this method have been formulated to match your original eyebrow color, and if the eyebrows are still present, blend perfectly into them. The results are a natural, flawless, fuller looking brows. Initially, the brows appear darker, but fade significantly over a two week period. It is absolutely crucial to have a touch up done, as it is very difficult to predict how well the skin will retain the pigment. The results can last anywhere from 11 to 18 months, depending on different factors affecting the procedure. However, a touch up once a year is recommended to retain the shape and saturation of pigment. 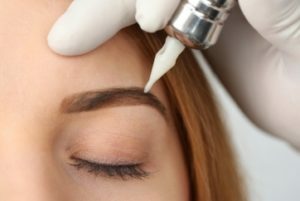 Hair stroke eyebrows otherwise known as the feathering technique, is a technique used to create the most natural permanent brows possible. The feathering technique mimics your own eyebrow hairs thus creating a natural eyebrow effect. This innovative technique is by far more natural looking than a solid fill in the permanent makeup world. 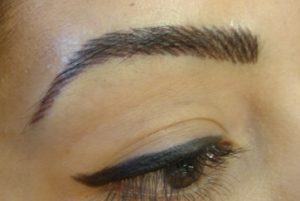 A touch up is required within four weeks and after that eyebrows last for one-two years before having to consider another touch-up. If you’re someone who prefers a fuller brow but with a soft texture, you may want to consider the color wash technique. The color wash technique mimics the appearance of conventional brow makeup whether it be a brow pencil or brow shadow. Eyebrows look very defined and with proper care would last two-three years before next touch-up. * Touch up pricing is only valid if the service is performed by technician performing original service. If a different technician is chosen or if the original treatment was performed outside of The Beauty House, the touch up level & pricing is at the discretion of the technician.